People of God, this morning we are going to sample a little more of the Lenten journey in the Psalter by focusing on a small portion of the lengthy Psalm 107. This is a psalm of desperation. It is a song of dire predicament, sincere petitions, a glorious pardon, and jubilant praise. Though it specifies a variety of circumstances, this psalm does not want us to focus on the circumstances as much as it calls us to give thanks. Sermon: You may be familiar with the great artist Giotto’s famous painting entitled The Raising of Lazarus. The painting is a sermon in and of itself. Giotto portrays Jesus as Creator when He lifts His hands in the blue sky. In this fascinating painting there are worshipers, skeptics, some with their hands in their noses because of the stench of this man who has been rotting in the tomb for four days; and when you consider this glorious painting you realize that Giotto is bringing us into this narrative. 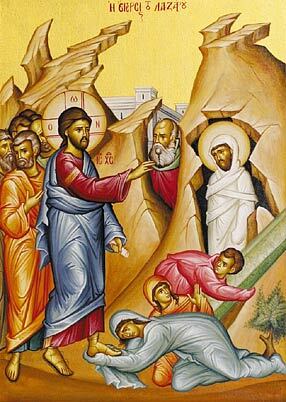 The Creator Himself in the form of man has entered into the messiness of man to make him whole; to resurrect not just Lazarus, but all of those who trust in Him. Introduction: In our Gospel Lesson, the Samaritan woman is incorporated into a new community by the love of Christ, the great Bridegroom. Introduction: People of God, in our Gospel Lesson we will see that Jesus Christ will cleanse the world by dying. Sermon: Every Gospel writer looks at Jesus from different perspectives. The reason they do is to provide for us the full picture of who Jesus is. The gospel of St. John sees Jesus as the great Priest. It is a priestly gospel. What does a priest do? Particularly, in John’s gospel, the priest cleanses the temple. The ministry of Jesus is one of tearing things apart for the sake of restoration. So, in John 2, Jesus cleanses the temple by overturning the idolatry of the temple. He overturns their tables as a sign that he is overturning their entire system. Their temple is corrupted and diseased. Jesus, as priest, has the responsibility to destroy any thing that is leprous. The temple is filled with leprosy and Jesus is beginning the process of cleansing. The priests in the Old Covenant did the same thing. They were sufficient for that time; they were temporary cleansers; but they were not sufficient for this new era of the Kingdom. The people needed a faithful priest; a mature priest; one who communed with the Father in perfect harmony.